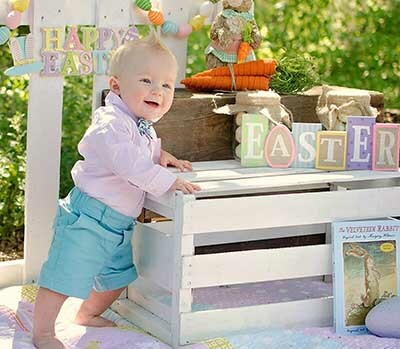 The cute Easter baby picture ideas will share tips for easy DIY Easter photography props and outfits that will enhance your baby Beatrix Potter or Peter Rabbit's first photo shoot and make it even more adorable. There are some Easter DIY crafts that can be adapted for use as props as well as some crochet projects that moms can use to fill the time after the nursery is all set and ready to go. 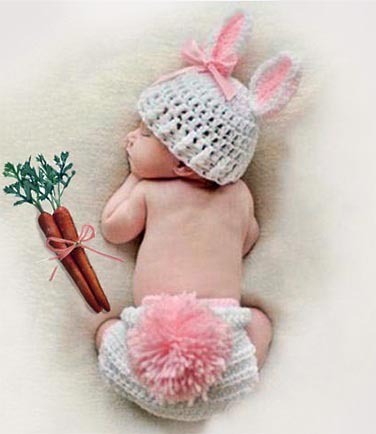 Please share your cute Easter baby picture ideas with other parents! Go here to see more Easter outfits suitable for a boy or girl's first portrait. 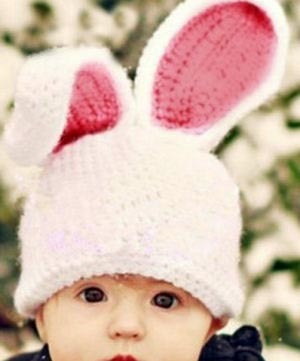 A crochet hat with bunny ears is one of the best, cute baby Easter picture ideas. A matching baby diaper cover with a fluffy, bunny tail is a nice touch. Find an easy pattern for a plain crochet beanie hat pattern that has a matching diaper cover. Add ears and a pom pom for Easter and then remove them after the holidays. Whether baby's feet are covered or not in a portrait is a matter of personal taste. 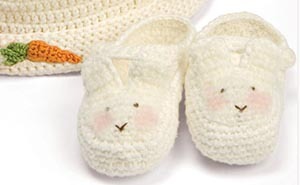 Baby's first Easter picture is an excellent opportunity to show how much the crocheted bunny booties are appreciated. Consider adding the booties to the display of keepsakes in a shadowbox to protect them. 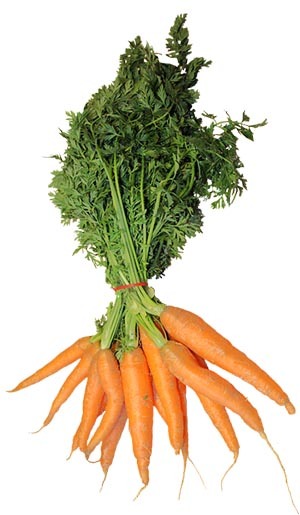 A small bunch of artificial carrots will add an Easter Bunny reference to the portrait. Silk carrots are relatively inexpensive but buying real ones available in the produce section of grocery store or from your local grocery have the advantage of being used to make baby food once their use as a photo prop is no longer required. 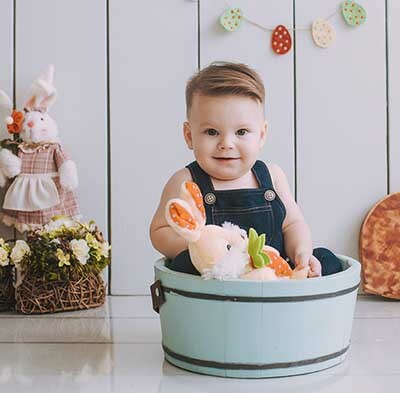 An old tin or wooden washtub with hidden pillows to support a baby boy's back makes a comfy Easter baby photo prop. Dress the little guy in denim overalls for masculine flair. 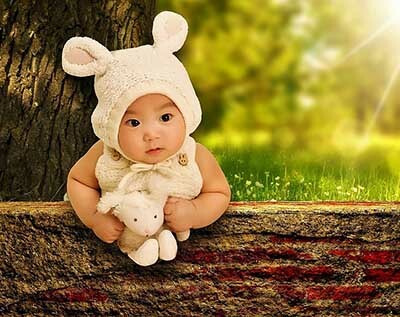 A pink hat with sweet bunny rabbit ears is perfect for a baby girl photo shoot. Whether your bunny ear photo props are handmade from fabric, crocheted from yarn or paper cutouts really doesn't matter! 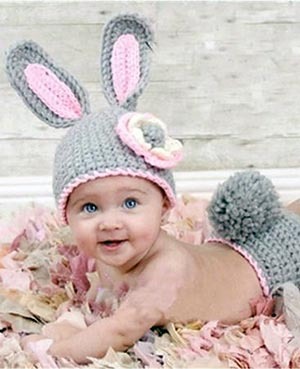 I hope that you have found some cute Easter baby picture ideas and that you will share your little one's portrait with visitors that stop by Unique Baby Gear Ideas looking for inspiration and props. I love the pattern for the Easter bunny ears! Join in and write your own page! It's easy to do. How? Simply click here to return to BABY PICTURES .